Courses at CEA Rome Center are designed in conjunction with, approved, and transcripted by the University of New Haven. UNH is regionally accredited by the New England Commission of Higher Education (NECHE), formerly known as the Commission on Institutions of Higher Education of the New England Association of Schools and Colleges, Inc (NEASC). Located in the historic surroundings of Italy’s capital city, the CEA Rome Center offers interdisciplinary programs spanning business, politics, Italian language, cultural studies, and liberal arts. With the great city of Rome as your classroom, you can choose courses offered in both Italian and English, and enjoy the opportunity to improve your language skills and further your academic pursuits while immersed in a historic cosmopolitan setting. 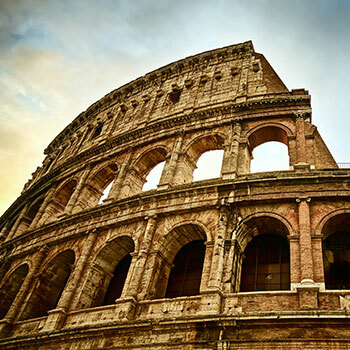 Designed to exploit the natural strengths of Rome's modern pace as well as its historic past, the curriculum at the CEA Rome Center offers you distinct study tracks, based on the study of Italian language & culture, business, politics, and history. Whatever program you choose, you’ll engage in activities designed to take the curriculum out of the classroom and into the community, like visits to galleries, museums, city council chambers, local businesses, food markets, and artisan’s workshops, as well as first-hand encounters with artists, architects, local businesspeople, writers, curators, and Italian students. Even outside school hours, we’ll encourage you to apply lessons learned in class to real-life, drawing connections between your studies and the daily life of your host community. This ongoing, active, and reflective structure of study not only helps you gain historical and social understanding, but helps you develop the international cultural fluency you need in an increasingly globalized world. The CEA Rome Center also helps you critically reflect upon and articulate your own national, cultural, and social identities. Active class participation provides the opportunity for interaction and collaboration, both critical factors in academic and professional success. CEA Rome Center faculty are committed to fostering students’ intellectual and cultural growth through simulated debates, multi-media research presentations, and round-table discussions. Courses taught at the CEA Rome Center have been designed in conjunction with and approved by the University of New Haven (UNH). Faculty appointments are also approved by UNH. After the successful completion of a session at the CEA Rome Center, you’ll receive credit from UNH. Located in Connecticut, the University of New Haven is a student-focused, comprehensive university and is fully accredited by the New England Association of Schools and Colleges (NEASC). Classes are taught by international faculty selected by CEA and approved by the University of New Haven. Faculty are bilingual (English/Italian) and represent diverse backgrounds. You’ll attend class with other CEA students of equivalent language levels, not with native Italian students. Teaching styles in Italy may differ from those in the U.S. Be prepared to adapt to different classroom structures and coursework expectations. Language and elective course sizes range from 10 to 20 students. Small class sizes mean more personalized attention from instructors. In order to determine a quality point ratio, each letter grade from a completed course is assigned a quality point value. The quality point value for each grade earned during a semester is multiplied by the number of semester hours assigned to that course. The sum of these points is the total number of quality points earned during the semester. It is divided by the number of semester hours completed to obtain the quality point ratio (QPR). Providence College is accredited by the New England Association of Schools and Colleges (NEASC). The CEA/Providence College Center for Theology and Religious Studies was established in 2010 at the CEA Rome Center. This exclusive collaboration combines CEA's outstanding academic management and support with Providence College's distinguished academic leadership and religious tradition; Providence College students can learn more about their unique program, PC in Rome. The Center provides the opportunity to study theology and religion in the heart of Rome, a cultural and religious crossroads and center of the Roman Catholic Church. With this great city as your classroom, you’ll enjoy a unique opportunity to further your academic pursuits and improve your language skills while immersed in a historic, cosmopolitan setting. Courses offered in Italian and English are held at the CEA Rome Center and at significant sites in and around the Eternal City, including the Vatican Museums, St. Peter's Basilica, and the Catacombs of San Callisto. Local experts and scholars, and visiting Providence College faculty teach courses. Upon successful completion of your program, you’ll receive two transcripts: one from Providence College (theology/religious studies courses), and one from the University of New Haven (language and other area studies courses). Theology/religious studies courses available to CEA/PC students are approved and transcripted by Providence College—a four-year, co-educational, Roman Catholic college of liberal arts and sciences located in Providence, Rhode Island—and accredited by the New England Association of Schools and Colleges (NEASC). Credits earned in theology/religious studies courses are easily transferable to U.S.-accredited institutions. Learn more about Providence College. Language and area studies courses taught at the CEA Rome Center are designed in conjunction with and approved by the University of New Haven (UNH). In addition, UNH approves faculty appointments for language and non-theology course electives. Located in Connecticut, UNH is fully accredited by NEASC. Classes are taught by international faculty selected by CEA, and approved by Providence College and the University of New Haven. Class size ranges between 10 and 25 students. Small class sizes mean more personalized attention from instructors. You’ll take language classes with other CEA students of equivalent language levels, not with native Italian students. Instructors will carefully evaluate your work and progress throughout the academic session. When calculating final grades, instructors consider written and oral exercises, homework assignments, attendance, classroom participation, and exam performance. Incomplete; becomes "NF" if not completed by mid-semester date of the following semester. Instructor reported that enrolled student never attended course. Course not finished within required time; this grade is computed as an "F."
Instructor has not submitted grade; becomes "NF" if not resolved by mid-semester date of the following semester. Approved withdrawal from a course; this grade is not computed in the GPA. John Cabot University is accredited by Middle States Association Commission on Higher Education. Founded in 1972 as a four-year, liberal arts and sciences university, John Cabot University (JCU) is a leading university in Rome. Named for John Cabot, a Venetian who sailed the world under the British flag, JCU exemplifies its namesake’s qualities of exploration and internationalization. JCU is located on two campuses in Rome’s Trastevere quarter on the river Tiber, near St. Peter's and the Vatican, and a 45-minute bus ride from the CEA Rome Center. Your classes will take place throughout the city, as well as inside the classroom in subjects including art history, business administration, classics, communications, English literature, film studies, history, Italian literature, music, natural sciences, psychology, philosophy and religion. JCU is committed to providing you with an active learning environment. You’ll attend classes with other CEA, Italian, and international students, giving you the opportunity to encounter many of the world's cultures on one of Europe's most exciting capitals. JCU runs on the American academic calendar and is accredited by the Commission on Higher Education of the Middle States Association of Colleges and Schools. International faculty from John Cabot University will teach your elective classes. Assessment is based on participation, exams, and individual and group projects. Class size ranges from 15 to 50 students. You will attend class with CEA students, other international students, and Italian students. The University uses the numerical values to compute semester and cumulative grade point averages. The semester GPA is the arithmetic mean of all classes taken in that particular semester (average grade for the semester). The cumulative GPA is the arithmetic mean of all classes taken at JCU (average grade over time). A letter grade for each course, semester GPA, and cumulative GPA will appear on your transcript. LUISS is accredited by the Italian Ministry of Higher Education. LUISS University (LUISS) was founded in the mid-1970s to provide an innovative, flexible education that allows students to feel a sense of mastery over their futures. Today, LUISS is known for its highly selective admissions, alignment with market demands and the business world, and the study of information technology and foreign languages. LUISS is officially accredited by the Italian Ministry of Higher Education (last revision of accreditation decree: Art. 1, Law 243/1991) and offers degrees at all academic levels in business studies, economics, politics, and law. For the past 15 years, LUISS consistently ranks among the top three Social Sciences institutions in Italy. The school attracts top talent in both students and instructors, and is firmly committed to the highest international standards in teaching and research. Thanks to its affiliation with Confindustria, the Italian Industrialists' Confederation, LUISS has close ties to Italian industrial concerns, most of which operate internationally. For decades, the institution has played a key role in Italy's economic and cultural development, training world leaders sensitive to the values of market culture and the rules of a modern democracy. Alumni have also made important academic contributions in economics, finance, law, and political science. Located on six campuses across the exclusive Parioli neighborhood, LUISS is a 20-minute bus ride from the CEA Rome Center. The main campus offers a modern study environment with the latest in technology for more than 8,000 students. Architecture features open, dynamic, transparent spaces that fully express the sense of community and the intensity of life at LUISS. You’ll attend class with other American, Italian, and international students, giving you the opportunity to engage with diverse cultures in a formative experience of intellectual exchange. International conferences, symposia, workshops, and guest-lectures further enrich your academic experience. International faculty will teach your elective classes. Periodic exams, homework assignments, and final exams will also be administered. Teaching styles in Italy may differ from those in the U.S. Be prepared to adapt to classroom structures and coursework expectations for your school. You will attend class with fellow CEA students, other international students, and Italian students. LUISS is one of the first European universities to adopt the European Community Course Credit Transfer System (ECTS). ECTS was created to promote academic recognition of studies undertaken abroad by aligning European institutions and broadening students’ educational options. By creating common standards for credits and grades, ECTS facilitates the acceptance of students' academic results. ECTS transcripts present academic results in a clear, complete, and comprehensive manner in order to ease the credit transfer process. ECTS is increasingly accepted by U.S. institutions; however, you must consult with your home institution to ensure final acceptance of credits. Half French, Half Italian raised in the Middle East, Rebecca considers herself a true citizen of the world. This sparks in her an immense curiosity for all the wonders our planet has to offer, which led her to travel with nothing but a backpack for two years in the pursuit of the unknown. Luca Micheloni was born in Marino, a small town close to Rome, and he graduated with a degree in Sociology and Social Sciences from the University of Rome, ”La Sapienza.” While at university, he worked within the hospitality sector, and his thesis was about the learning process within a working community connected to the hospitality industry—a great subject for a future Student Services Advisor at CEA! As Center Director for Rome, Anna Felberbaum is responsible for office administration and the day-to-day management including staffing, student services, host institution relations, local vendor relations, and student evaluations. Anna advises students on issues related to academics, cross-cultural information and health and safety. Alexandra supports educational development and has taught History of Art at the CEA Rome Center since 2008. She holds her [Ph.D. in XXXX from the University of Warwick,] a Diploma with Distinction from the Study Centre for the History of the Fine and Decorative Arts at Victoria & Albert Museum, and an MA with Double Distinction from London’s Courtauld Institute. Dr. Massini is an accomplished art history speaker and consultant, art collection collaborator, and Rome guidebook author.Alexandra supports educational development and has taught History of Art at the CEA Rome Center since 2008. She holds her [Ph.D. in XXXX from the University of Warwick,] a Diploma with Distinction from the Study Centre for the History of the Fine and Decorative Arts at Victoria & Albert Museum, and an MA with Double Distinction from London’s Courtauld Institute. Dr. Massini is an accomplished art history speaker and consultant, art collection collaborator, and Rome guidebook author. As Academic Advisor for the CEA Rome Center, Chiara Ortolani serves as the primary contact for students and faculty regarding everyday academic issues. In addition, Chiara works with the Italy Assistant Academic Dean in all aspects of course registration, the coordination of class schedules, classroom use, and academic facilities management. Andrea graduated from the Department of Literature and Philosophy at the Università di Pisa with a degree in the History of the Church. He subsequently earned a master's degree in Human Resources. Soon after graduation, Andrea worked as a social worker, focusing his attention on adolescents and the needy. He then moved on to the field of Human Resources in managerial development and hiring for a multinational company. As Student Services Assistant, Cecilia is the first point of contact for all students when entering the center. She supports them in their everyday requests, helping them make the most of their time abroad by assisting them on everyday questions, travel plans and even tips on the Roman culture. She considers this job very important and values the interaction with students as a great opportunity for cultural and personal enrichment. Delve into the political, economic, and business implications of globalization, as well as the impact on society as you develop valuable skills applicable across a wide range of career opportunities. Examine the complex relationships between business and society and learn how psychological principles can be applied to the workplace to overcome organizational challenges. You’ll gain first-hand experience in local business strategies and how to influence behavior as you explore local environments, meet with professionals, and take academic field trips that provide real-world perspectives. Build the international cultural fluency you need to effectively navigate an increasingly global world.